Lack of focus is NOT inevitable. However, if you let it be a problem in your life, it can keep you from achieving your potential. On the other hand, the power of focus cannot be denied. In fact, it is the secret to success. We live in a world of information overload and massive distractions from television, computers, and other technical devices that can be overwhelming and distract you from your goals. Only a few decades ago, we were limited to the information we could access and news from other parts of the world came slowly in bits and pieces. Today, Google, Amazon and Internet news bring the world to our doorsteps and our cellphones are libraries of valuable information. We have instant access to details of worldwide events 24/7 that continuously pound our brains unless we make a serious effort to isolate ourselves. The simple fact is that we live with a multitude of distractions every day! As a result, unless we understand and develop the ability to focus, it may be difficult to focus on tasks that improve quality of life and bring ultimate success. The ability to focus today (more than ever) requires the development of strong cognitive skills that control thoughts and impulses. Everyone has used these skills at one time or another. For example, you turned down a sugary delight that would have ruined your diet – or stuck to a reading assignment for class when you would have preferred to watch your favorite TV show. Using such mental skills takes practice and sometimes years to develop. When children learn at an early age how develop their ability to focus, it boosts their mental skills considerably. Studies show that when children are taught to control their impulses and develop long attention spans, they cope with life challenges better and are much more likely to be successful professionally. In fact, the ability to focus can often outweigh the importance of a high IQ or socioeconomic advantages when it comes to being successful. I realize that none of my readers are children, but there is still hope. There are activities that will help improve your ability to focus. In fact, you may already be involved in some of them. Computer skills, short-term memory skills, yoga, and the discipline of tae-kwan-do can significantly enhance the mental skill of focusing. The world in which we live makes focusing a challenge – it is not as simple as it once was. However, many people can and do focus their minds on tasks at hand several hours each day. If you have trouble focusing, now is the time to take steps to improve your mental ability to do so. Seek out activities that will strengthen your ability to focus. It can and must be part of your skill set if you want to be successful at any endeavor. The power of focus must not be ignored. 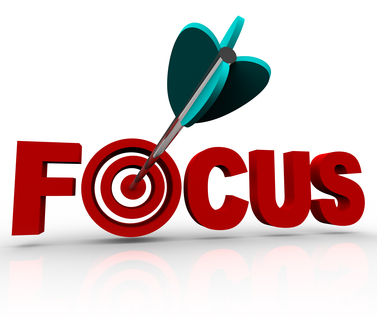 Strong focusing skills brings an enormous amount of energy into anything you do. For more information, check out online sites, books and other sources. I challenge you to do what you must to FOCUS and be successful!